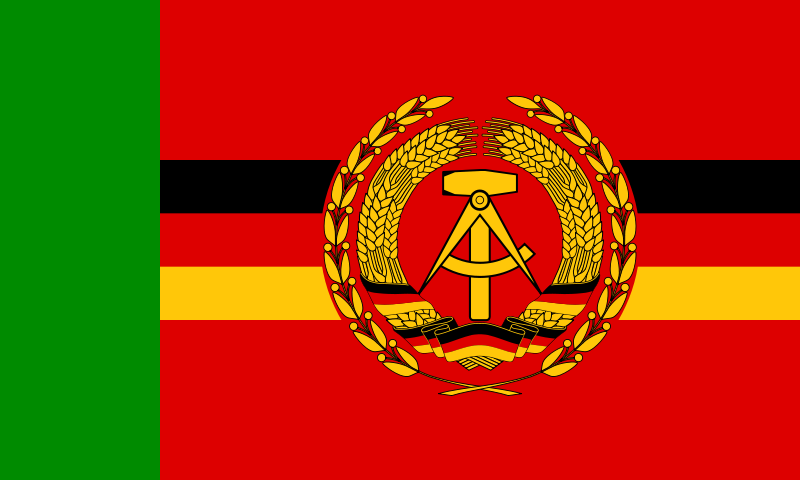 As the principle maritime force of the East German National Volksarmee, the Volksmarine was operationally incorporated into the United Baltic Sea Fleets of the greater Warsaw Pact sea force . Its designated area of operations was the Baltic Sea area and the entrances into the Baltic Sea. Its primary task was to keep the sea lanes open for the arrival of Soviet reinforcements and to conduct offensive operations against the coasts of enemy nations in the Baltic Sea area of operation. For conducting these missions, the Volksmarine was equipped with a substantially light force consisting of anti-submarine vessels, fast torpedo boats, minesweepers as well as landing craft for supporting the Army and conducting amphibious assault operations. The main operations the Volksmarine found itself conducting were heavily focused on engaging in extensive reconnaissance activities, carried out mainly by the minesweepers and specialized electronic surveillance boats against West Germany and her NATO allies. When the Grenzbrigade Küste der Grenzpolizei (GBK) (Coastal Border Brigade of the Border Police) was absorbed into the Volksmarine from the Grenztruppen der DDR in 1961, the 6th Border Brigade (Coast) consisting of fast torpedo boats and other rapid assault forces were stationed on the Bug peninsula of the island of Rügen. The 6th Flotilla as it came to be known had a special responsibility concerning the prevention of republikflucht. 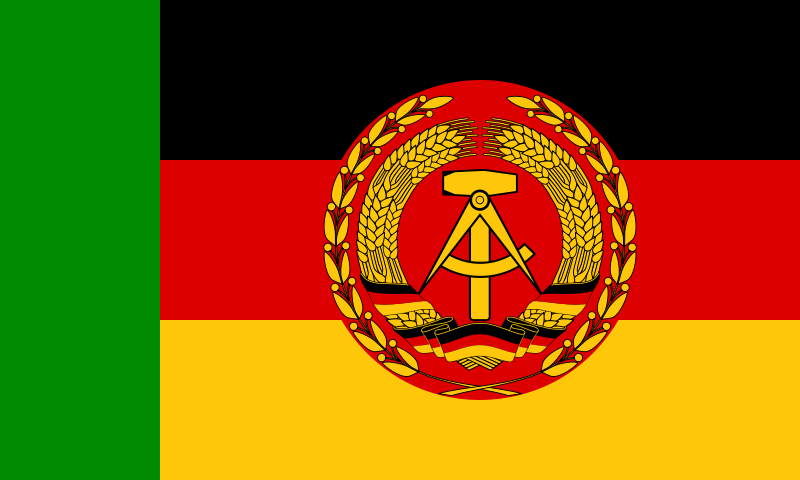 This was the unauthorized defection of East German citizens into the West. With effect from 1 November 1961 it was subordinated to the People's Navy. 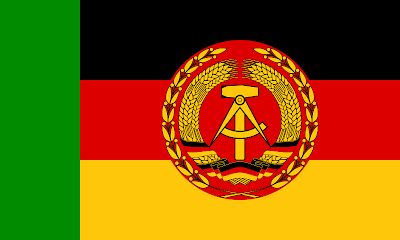 It had a substantial number of small patrol boats and surveillance posts along the coast tasked with preventing anyone from leaving the GDR without official exit permission. Throughout the duration of it's existence, the Volksmarine while notably the smallest of the East German armed forces would maintain an exceptional state of readiness. It maintained a personnel force of around 18,000 soldiers, a fleet of various types of ships as well as three squadrons of navalized helicopters including Mil Mi-4 Hound, Mil Mi-8 Hip & Mil Mi-14 Haze helicopters and a squadron of Sukhoi Su-22 Fitter ground attack aircraft acquired from the Soviet Union. The uniform displayed here shows Paradeuniform (Parade Uniform) of an enlisted Maat auf Zeit (Petty Officer 3rd Class) in the East German Volksmarine. The Middy top is the standard style worn by navys world over and is constructed of a polyester/cotton fabric with a flap collar of the traditional navy type of blue with white stripes and stars, and decorated sleeve cuffs. Unlike tunics, shoulderboards are not worn with the Middy as ranks and occupational specialties are displayed on the sleeves of the uniform. 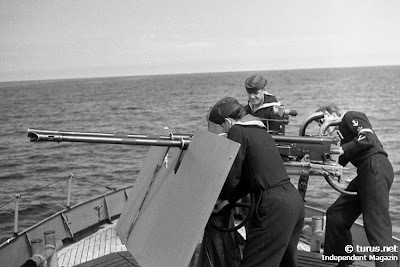 Middys varied as they were initially issued without buttons but as the wearer earned specialized decorations such as the shooting cord, the naval service buttons were purchased and sewn to the uniform for mounting of the devices. The shoulder loop was usually secured to a button on the shoulder and the other end secured to another button inside the Middy typically hidden underneath the service tie. The cap shown here is the 'Donald Duck' style cap complete with the Volksmarine service cap tally. The enlisted man's cap was visorless and was mostly constructed of wool. 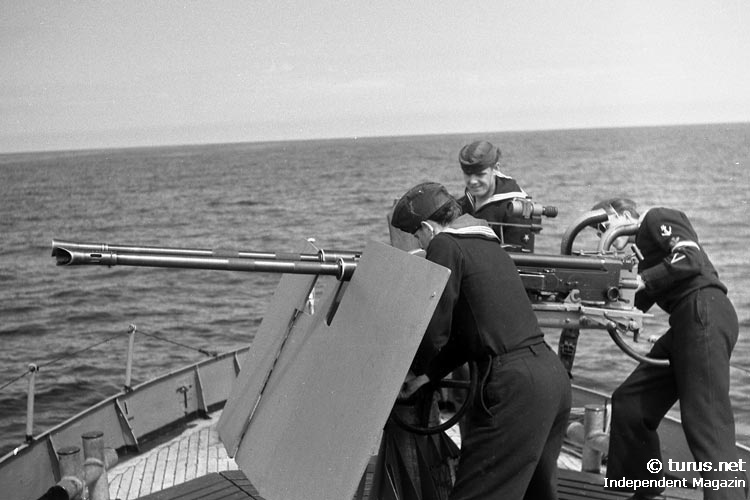 It was dark navy blue in color and depending on the event in which the sailor was participating in the cap was worn at times with either a white or blue cap cover. This type of hat was worn wth the service uniform as well as walking out dress ceremony and parades. Note the standard interior marking of NVA for the East German National Volksarmee. This example shown here carries a letter 'A' designation meaning the cap was manufactured in 1977. The number beneath the NVA stamp represents the size of the hat in centimeters, this example is 54cm or roughly 6¾in by American sizing equivalents. Here's a close up view of the national insignia worn by the enlisted personnel within the Volksmarine ranks. Note its distinct gold construction of the national roundel lacking the gold wreath of the officer corps. Here's a close up view of the Volksmarine cap tally of service caps of the Volksmarine. Here's a close up of the optional white cap cover usually worn with the 'Donald Duck' style caps typically worn during parades such as the annual Ehrenparade (Honor Parade) in East Berlin to celebrate the founding of the German Democratic Republic. A manufacturer's tag from within the white cap cover showing that it was made by the VEB Hutwerke Guben Hat Works in Lunzenau, East Germany. Shown here is a close up of the rifleman shooting cord awarded to enlisted personnel who are not assigned to coastal units or rocket/artillery units that maintain other specialized shooting cords. The Navy shooting cord is a braided blue polyester cord with a gold faceplate design of twin crossed rifles with fixed bayonets encircled by a wreath of oak leaves. Shown here is the service tie worn with the Navy Middy. The black tie is adorned with a small decorative white bow. Instead of the Kragenspiegeln associated with other forces, shown here are the combination of insignia patches and service stripes worn by enlisted personnel on service Middys. The top patch appearing to be of a gear represents the rank of Maat auf Zeit (Petty Officer 3rd Class) along with the service stripe (2nd patch) and the final patch on the bottom is for the occupational specialization of the Elektrotechnik (Electrical Engineering) often abbreviated as E-Technik division of service. Here is a close up of the decorative sleeve cuff of the Middy top complete with naval service button. Here is a better picture of the Middy flap collar as viewed from behind. It is the standard type worn by enlisted members of Naval services around the world. Shown here are the Navy blue trousers worn by the Navy. They are constructed of blue "Herringbone Twill" (HBT) fabric and again are unpiped with a button flap front. Here's a shot of the interior tag of the pants displaying them as a size M44. The M standing for A person of average height and the 44 being equivalent to 30-32in in American waist sizing equivalents. Here is an alternate cap showing the 'Donald Duck' style cap worn by sailors assigned to the Grenzbrigade Küste der Grenzpolizei (GBK) (Coastal Border Brigade of the Border Police) units. It is of the same construction as the type worn by Volksmarine sailors only with an alternate Grenzbrigade Küste cap tally instead of the Volksmarine tally. 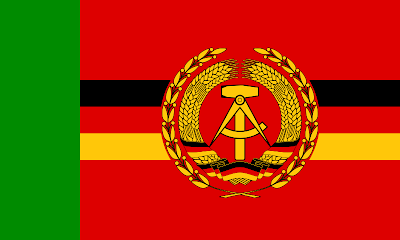 As shown earlier, note the standard interior marking of NVA for the East German National Volksarmee. This example shown here carries a letter 'A' designation meaning the cap was manufactured in 1977. The number beneath the NVA stamp represents the size of the hat in centimeters, this example is 54cm or roughly 6¾in by American sizing equivalents. Here is a view of the cap tally worn by the sailors of the Grenzbrigade Küste. Here is a third style alternate cap showing the 'Donald Duck' style cap worn by sailors assigned to the naval forces of the Grenztruppen der DDR. It is of the same construction as the type worn by Volksmarine and Grenzbrigade Küste sailors only with an alternate Grenztruppen der DDR cap tally instead of the Volksmarine or Grenzbrigade Küste cap tallys. Here is a view of the cap tally worn by the sailors of the Grenztruppen der DDR. Here's a close up of the optional blue cap cover usually worn with the 'Donald Duck' style caps typically worn during parades such as the annual Ehrenparade (Honor Parade) in East Berlin to celebrate the founding of the German Democratic Republic. Its construction is much more similar to the 'Donald Duck' hat instead of the white cap cover. Here is a honor pennant presented to commemorate the service of the Grenzbrigade Küste der Grenzpolizei (GBK) (Coastal Border Brigade of the Border Police) to the East German armed forces. It shows a patrol boat and a border surveillance tower along the northern East German coastline utilizing the color green which was specialized of Border Control units (Grenztruppen der DDR & Grenzbrigade Küste). This pennant was presented during the 20th anniversary of the East German armed forces in 1976 and is embroidered on the back with the anniversary dates and the East German armed forces coat of arms. Sailors of the Volksmarine march in the Tag der Republik parade celebrating the establishment of the German Democratic Republic on 7 October 1988 in East Berlin.